Gneisenau vs Bismarck, too similar yet too different, I'm slightly confused. I'm just about to unlock the Bismarck, and as the Gneisenau is my favorite ship so far, I hope I will enjoy the Bismarck as well. However, after looking through recommended builds, I'm confused. First a few words about my playstyle with the Gneisenau. At around 30 battles I had a winrate deep below 40% with her. Partly because of not understanding her strengths and weaknesses, and partly because of a long losing streak with horribly unlucky matchmaking. Now, nearing 100 battles with her, I managed to go over 50%, by having the last 60 or so battles won 2/3 of the time. At the beginning I usually am among the first to engage the enemy, use my superior speed (always using speed flags) to then disengage, dodging shells, drawing fire, then disappearing and healing. After that, I play a cruiser-like role for a while, and when most ships already engaged each other, I charge in and brawl. Works well so far. And 2 skills I don't know how to spend... As a semi-casual, I guess I won't get up to level 19 any time soon. I'm tempted to go Preventive Maintenance+Adrenaline Rush, because with my playstyle I don't see much point in taking Concealment Expert. Neither do I see the point in manual secondaries. Despite having AFT, I didn't take Secondary Battery Mod 2, because better aiming for my main guns is important for me at the beginning of the battle. I scored quite a few cruiser citadels which I would have had a harder time getting without Aiming Systems 1. I like having a secondary range of 7 km, to scare destroyers away, keep them at an arm's length. I plan using the 10-level captain purchased with coal. But I don't have the faintest idea what skills to take. - most guides recommend Preventive Maintenance over Priority Target. Why? I would guess because she has Hydro, I won't need to be so careful when I have to begin my turns. - most guides recommend Adrenaline Rush instead of Expert Marksman, and they don't take Expert Marksman at all, even at level 19! Why? The turning rate of her guns is exactly the same as the Gneisenau! And even worse, with half her firepower at the stern, it would be even more important to rotate them fast! - most guides ditch Superintendent in favor of Basic Firing Training. Why? Having one less healing charge would hurt in a long battle, and would a slight increase in secondary firepower really turn the tide of a battle? I would guess it would increase the total damage output by less than 1%. - most guides recommend Advanced Firing training and manual secondaries. Seems obvious, for a secondary build, but what is really the purpose? To have, after a battle with 100k damage, 5k damage with secondaries instead of 2k? What's the point? I played the Halloween version of the Bismarck with manual secondaries, and I didn't cause any significant damage with my secondaries. And in a brawl I always have to be careful about selecting targets, instead of being able to fire at 2 DDs at once, and keeping them both at range. Bismarck being toptier with secondary build -> you can cause quite some havoc with it. Most of the armor wont withstand your secondaries, and the engagements are closer in general. Back when i played Bismarck i did go for secondary build. Then i didnt go for FDG for a looong time, mainly because it was so bad. Did that after last summer, and skipped FDG with FreeXP, with GK i ditched the full secondary build too. Focus on the mainguns, but i left manual secondaries in, but took CE instead of the other stuff. Concealment really helps to manage your engagements, and Aiming system makes accuracy more bareable rather than a bit more secondary range. as for the cptn build. Take PT if you want - imo PM isnt needed on a BB. Definetely take SI first! More heal is always good for a BB when you dont yolo in. Personaly id go for CE first these days. The concealment is decent, and it can help you to get in closer and get your mainguns to work. Also you can get out easier if the crap hits the fan. Dont want to rain on your parade, but T8 MM is in a rough spot atm. Bismarck still ejoyable though. More details below. At least 60% of the games you will face TX which means fighting Zaos and Des Moines and Haregumos and Worchesters. Guess what that means? There will be alot bigger fish in the pond with you, you will be on fire practically the whole game. And you ain't gonna be brawling much for the first 10-15 minutes (but often it is still possible if you pick the moment right). Now I did my Bismarck grind just a month back and currently work on FdG and I enjoy both a lot, so they can still work. One point left over for your discretion. Damage control 1+2 for reducing amount of fires and fire duration. 1) No big reason to pick preventive maintainance over Priority, do as you see fit. 2) EM not needed for me, as the traverse is already decent enough to stay on target in max turns. AR adds potential 10-20% dmg so I prefer that. Do as you prefer. 4) Tool to stay alive first, then manual secondaries if you like secondaries. Dont bother with AFT if you actually want the secondaries to hit something DD sized at 9 km. Thank you! This was insightful. I guess I'll just play her in co-op with zero captains skills (to unlock modules) until 0.8 comes out. What I don't understand is why don't you recommend AFT but still recommend manual secondaries. With tier 10, isn't the range too small without AFT? And I still don't get how secondaries can decide battles. How much damage do you typically deal with secondaries? For me, investing into the range of secondaries was done purely to keep DDs a little farther away from me. Sacrificing main gun accuracy for more secondary range? Why is it worth it? Sacrificing 4 captain skill points for slightly more DPM at close range? Why? BAF is 3 captain skills, not 4. And that is the only skill that will give secondary a better DMP. AFT does nothing for DMP at 4 points, it only increases the range. I meant manual secondaries. With BFT it's 7 points. Manually secondary so called makes the secondary guns far more accurate. So guess that skill does increase DMP in a round about way. Really, if you want to build the secondary to maximum. You should take BAF, AFT and Manual Secondary for max range with better DMP and better accuracy. That's 11 points used up. Then decide what you use the other 8 points on? But then there is also IFHE skill for 4 points as well. Pretty sure that skill can make the secondary guns better on pen up to (139mm again). So you can end up using 15 points just to max the secondary guns out. By all means play her in randoms, just grab the first 10 points worth of skills. You have to realize my build is a compromise of what I would like and what the meta dictates. What works for me may not work for others. About AFT, I use that on just about all other BBs at T8+ for the AA range. You have to consider that with the CV rework coming out in 0.8 everything AA related is quite hazy. Also I wanted my german BBs to be my "fun" ships, and by fun i mean secondary build. I also thought my drunk secondary gunnes missed almost all the time at longer ranges. Thus I tried Manual secondaries (MS), as the mandatory survival related skills dont leave room for AFT and MS both. I use the secondary module to make up the range lost from not picking AFT (good arguments can be made for useing AA range or main gun accuracy too). German dispersion on the main guns is just unreliable at the best of times, accuracy module or no - only closing the distance will really change that. No reason to throw good money after bad. It is true GK and FdG will outrange your secondaries by about 1,2 km (10,9 with AFT to 9,7 without). However I found it easy to play around the range difference, since in almost every situation it didnt matter if i closed an extra 1,2 km or not. Either you can brawl, or you know cruisers will burn you to a crisp before even getting close to that range. And 9,7 is plenty for wrecking DDs and setting fires on other non-german BBs. The Yamato and Republique can match german secondary range i believe, not much else can. I say that because take a look on WIKI at something like the Matty B (USA Battleship). All it's secondary come under 139mm, so using BAF and AFT on that ship improves not some (but all it's secondary guns). Hm, good points. Maybe I'll even try manual secondaries on the Gneisenau if another captain retraining discount comes our way. What I still don't get is how much more damage one really does with manual secondaries, to make it worth 4 skill points. Too bad neither Vigilance nor Jack of all trades make sense on the Bismarck, so this might be a waste of Franz von Jütland. Still, I don't know of any other German ship where these skills would come handy, so, why not? I would guess Expert Marksman is not as often taken with the Bismarck as with the Gneisenau, because the Bismarck brawls at a slightly longer range. I'll still try to research some modules at least, I don't want to drag my teem down too much. Then i didnt go for FDG for a looong time, mainly because it was so bad. Doubt anyone knows how much damage the secondaries actually do. It is a combination of direct damage and fires. I went and checked my Bismarck stats, but I can only find Secondary hit rate, not damage. It sits at almost 25% for Bismarck. For my Gneisenau, it sits at 18% (without MS, but also shorter max range). What? Are you sure? It says "main battery guns with a caliber up to and including 139mm and all secondary battery guns." Yes, you go install AFT on a DD with main guns under 139mm (which they all have) and it will extend the firing range of the DD main battery guns. But you install AFT on a Cruiser with main battery guns over 139mm (which they all are over it) and you'll see no increase is gained in their shooting distance unlike with a DD. So any guns over 139mm will gain nothing from BAF and AFT. I use AFT on my DD because it extends the main battery firing range. But it doesn't work trying to do the same on a Cruiser because the guns are over 139mm for main battery guns. Sadly, nobody seems to know. Vigilance used to be a thing for DDs in ranked back in the smoke/torp meta. Nowadays, nobody uses it. JoaT is moderately useful but the only ships I use it on are Conqueror (to compensate for the extra long heal cd) and Minotaur (to get smoke back up). 1. I'm talking about the secondary batteries of a battleship. What does it have anything to do with the main guns of destroyers and cruisers?? 2. I went to check your stats to see how you stand with the Bismarck, and (besides the stats themselves) I see you don't even have the Bismarck! Or any German battleship at all! I hope you won't mind if I'll disregard any and all advice you have been written so far in this thread. Vigilance used to be a thing for DDs in ranked back in the smoke meta. Nowadays, nobody uses it. Because like I said to you before. Go look at WOWS WIKI for the Bismark and the calibre of secondary guns it's uses. 10 of the secondary guns are 150mm. 8 of them are 105mm. So BAF and AFT is only going to change the 8x 105mm gun. Not all of them, because 10 of the secondary go over the 139mm rule that BAF and AFT is limited to changing. It affects secondary guns regardless of caliber. Depends on what you want out of it. I play Bismarch with good old PT, AR, BoS, AFT, Manual Secondaries, SI and it works fine. Coal commander is good if you want any of his special skills. Else I'd just use free Hipper commander, which has 10 pts and no special skills. EM is unnecessary on Germans. Turrets return fast enough, dpm is more important. I never took BFT. Not on Bismarck. Maybe I take it on Gneisenau. The main issue is that secondary damage isn't worth it on Bismarck over sustain. Gneisenau's secondaries are better in that regard and might deserve it. Secondaries deal direct damage, but they also set fires. In Bismarck, 11.3 km secondaries are a 11.3 km area of HE annoyance. Gneisenau can deal a lot more direct damage. As for firing at two targets at once... Manual secondaries cuts dispersion in half, doubling accuracy, causing you to hit about twice as often. In any case where there is only one target is obviously benefitting from this. Any engagement where all targets are on the same side (so, engagements that are smart and where you can angle) benefit from this, as the secondaries on the other side wouldn't fire anyway. Any engagement where you fire on both sides is likely not very great to begin with, as you are out of position. In this case, focusing all secondary dpm on one target is still preferrable though, to make one die fast and end the flanking of your ship. Oh well, that's a new one on me. The way it's worded in the skills section certainty doesn't give that impression. It says all guns "up to and including 139mm". No mention of guns over that calibre. Nor does it say it affects "all secondary regardless of calibre". So they should reword that better then, it's very misleading. Ok, I'll try for a while without EM. I'll still keep the EM on my Gneisenau, as it often saved my skin, when running in between two ships, torping both of them, then having to quickly turn my guns against the survivor. I guess I won't need them as much with the Bismarck if I brawl the enemy at 7-8 km instead of 4-5 km. Oh well, that's a new one on me. The way is worded in the skills section certainty doesn't give that impression. It says all guns "up to and including 139mm". No mention of guns over that calibre. Not does it say it affects "all secondary regardless of calibre". So they should reword that better then, it's very misleading. 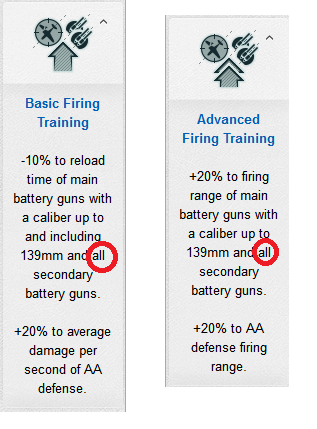 "main battery guns with a caliber up to and including 139mm and all secondary battery guns.﻿"
As you see, the criteria applies to main battery, not secondary.